80% of the city's collisions and casualties happen within 20m of a junction. Given the geography of the city, this may not be surprising, but it highlights action we all have to take to minimise risk. Key actions for drivers - as well as looking and anticipating - is to go back to basics - mirror, signal, manouvre. Let people know what you intend to do, having checked it's safe to do it. Cyclists - left hand turns are where a significant number of collisions with bikes happen. Check a driver can see you if near a side turn, they should signal as above - but may not. Be aware there are blind spots (especially with a large vehicle) - do not undertake near junctions. Pedestrians - when crossing the roads do the basics. Focus, phone/electronics away and let your ears hear what's around. Even if you take a risk and a bus has to brake, you may get away with it but passengers inside the bus may fall and injure themselves due to your action. Using cycle paths is a great way to explore the city but the council’s road safety team is reminding visitors to ‘share the space’ and look out for others. We've put up temporary “Share the Space, Drop Your Pace” signs along the seafront to remind cyclists to watch out and slow down for pedestrians and pedestrians to be aware of cyclists on the seafront cycle path. At our recent awareness day at the Peace Statue with the Sussex Safer Roads Partnership we gave away around 50 bike bells. This is an area where cyclists and pedestrians use the same space as they access the nearby crossing. We encouraged cyclists to keep their speed down and use a bell to calmly warn of their approach and asked pedestrians to look out for cyclists and not wander onto the cycle lanes. One issue that older and disabled people raise is that cyclists may not realise there are pedestrians with impaired senses or that they cannot move easily. Watch our film to understand the difficulties pedestrians and cyclists experience when coming into contact with one another. Failure to look properly / distraction is quoted over 42% of the time as the cause of a collision. Technology encourages us to be available and engaged all the time - through a fear of missing out. This has consequences on the roads - focussing elsewhere means we miss what's happening around us on the roads, whether we are a driver, rider or pedestrian. Probably the riskiest environment you'll be in today will be on the roads. Engage your senses and make sure your mind is focused on your environment when on the roads, not what's happening to you emotionally elsewhere. Take time to relax / take the heat out of your emotions before setting out. Do not use your phone or mobile device or get distracted by music. Research and observation of driver improvement courses shows that high emotions increase the risk of a collision. Make sure others can see you - and are aware of what you are about to do - and you can see what is around you. 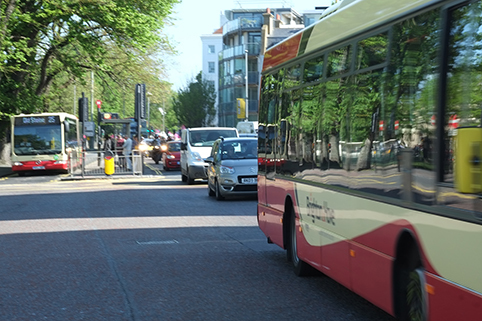 If you would like to comment or suggest an idea, please do so on the Facebook page: Share the Roads, Brighton & Hove. A review of 2017 casualty data indicates that "failed to look properly" remains the most significant cause for all road users - but it has reduced over the life of the campaign. Mistakes are human, but if we focus on the roads when we are on them, we lessen the risks for all.